From our Beaded Garland Collection of over 60 Beaded Garlands! 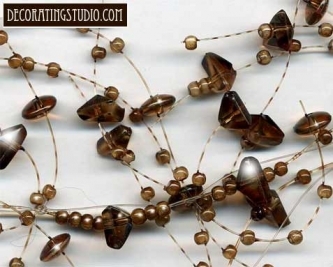 : "Chocolate Brown" 5 foot Beaded Garland has many different jewel shades, ranging from medium brown to rich brown. The mixture of colors in this beaded garland create a rich depth of color and design. Plus, you can cut the garland to any length and the beads will not fall off. Perfect for table and centerpiece decorations for weddings, parties and event decor.